When did food waste issues come to light? As recently as the 1990’s the United States had a food recovery coordinator, although, following the Clinton administration, that position was cut. Today in America, we waste 70 BILLION POUNDS of food! That’s about 15 million pounds more than we contributed to feeding millions during World War I (1914-1918) and it happens yearly! It’s a seriously staggering amount of food to get our head wrapped around. This fact means 25 – 40% of food grown, processed and transported in the US will never be consumed. This food is thrown directly in the trash or maybe composted and is primarily household driven. Ask yourself, when we waste food, who are going hungry? There is an enlarging effort for food recovery options across the nation to collect food that would be otherwise wasted, but does that really address the issue of food waste? What is food waste’s carbon footprint? You know, that thing we talk about when we talk about climate change. Finally, which part of food waste is actually, food loss? That piece that never should have made it to the level of waste. So many questions! The burgeoning question for me is how we got to wasting 70 billion pounds of food each year! 70 BILLION POUNDS! I can’t even imagine what that looks like. So over copious amounts of coffee and the not so occasional cup of tea, I set out to explore food waste and food loss to track down the culprit that led us to this beastly disaster. Food waste has a long history. When I decided to embark writing a series of posts addressing food waste, my first stop on this exploration was World War I. At this time, the US Food Administration pledged, on behalf of the American people to “feed the hungry millions of Europe — the Allies and liberated nations”. Food would be sent to not only feed soldiers, but women and children, as well. America definitely has a long history of reaching out to help other nations, particularly when it pertains to feeding those who are hungry. During WWI, everyone was required to come on board to meet the needs of the hungry overseas, even at the price of not having enough for our own. 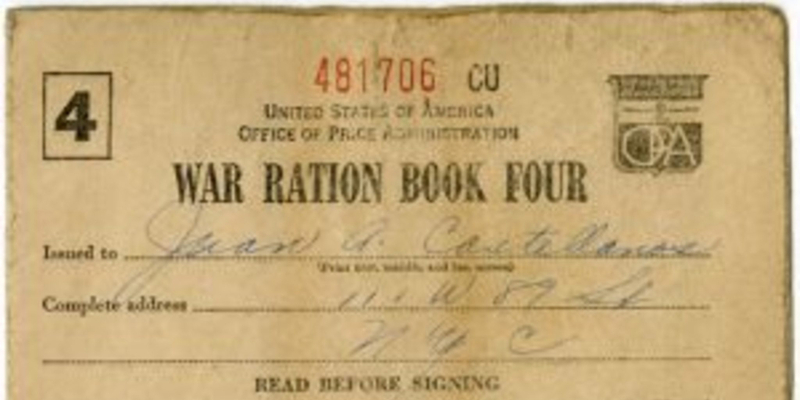 “Food Will Win the War” was proclaimed by the President, Herbert Hoover. 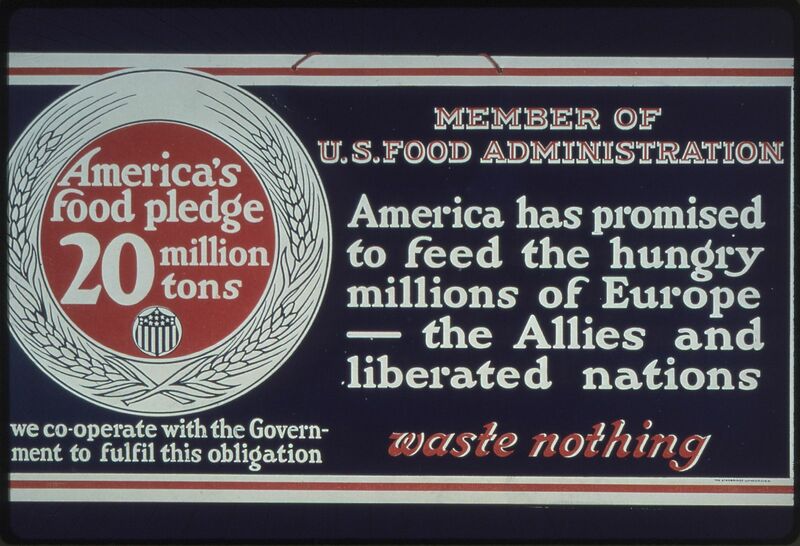 The US Food Administration’s campaign, “Waste Nothing” was launched in 1917. As a nation, we agreed to send 20 million tons of food overseas to curb the ever-growing number of those dying from starvation. “There is always enough to share”. The sharing was not only of food but also hunger. Slogan and artwork enticed and even goaded those who may need stronger urging, into contributing to this piece of the war effort. “Eat Less, Waste Nothing”. “-–Simple living -–Clean plates—No extra meal”. “Don’t Waste Food While Others Starve” (Yes, that was your mother reminding you to clean your plate, because children are starving in Africa. They are, but that’s another post.) “Buy fish, save the meat for soldiers”. “The Seeds of Victory Insure the Fruits of Peace”. “Waste Nothing” became code for dummy and glutton. It was government propaganda at its best! The guise of saving food served the purpose to unite the country behind the war. The Department of Education created a nationalized school garden program, funded by War Department monies and so was born the United States School Garden Army, encouraging students to become young “soldiers of the soil”. Liberty Gardens, later renamed Victory Gardens, sprouted to encourage gardening. They were cultivated in town squares, schools, other government buildings and on home properties. These gardens provided for healing through solidarity and connected back to the land, rapidly growing urban populations. In my next post, I’ll look at WWII and food waste. Which lessons were carried forward?